Balancing the available forage with the timing and number of animals on a site is key to effective grazing management. To accomplish that, the land manager needs to know the proper amount of forage to graze that will maintain enough cover to protect soil and maintain or improve the quality and quantity of desired vegetation. Measuring Residual Dry Matter (RDM) on annual pastures and using visual assessments on perennial pastures are simple and valuable tools that enable the land manager to balance animal needs and the land’s ability to produce feed. A field with a desirable blend of annuals and perennials will need a combination of these monitoring techniques in order to best maintain the viability of that blend. 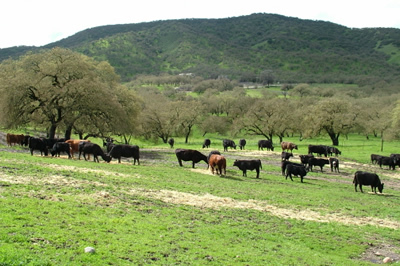 California annual grassland forage plants have short life cycles and shallow root systems and should be managed to insure proper residual dry matter (RDM) for the next growing season. Annual forage responds to conditions that influence plant germination and establishment in the fall and early winter. Although fall weather has the greatest impact on most annual plant growth, the water holding capacity of the soil and RDM from the prior season also influences growth. Managing RDM is the most effective way to improve the condition of the soil surface, increase its water holding capacity, and minimize the invasion of weedy or undesirable plants. Residual dry matter can minimize runoff and soil erosion as well as minimize the potential for manure to be transported to water bodies. The amount of RDM required to protect the soil will vary according to forage species, soil type, slope and annual rainfall. For example, areas with heavy rainfall, erosive soils or steep hills require more RDM than flat, stable soil in drier climates. California perennial grasses are found on many range sites and need to be managed differently than annuals if restoring perennial grasses to the ranch is a management objective. Native perennial grasses developed over millenia with natural wildlife herd movements. Herds tend to concentrate on a specific site and move frequently due to predator pressures. These types of high intensity, short duration grazing systems favor longer-lived, deeper-rooted perennial grass systems. Perennial grass systems tend to have higher infiltration rates, better soil quality characteristics, and longer “green” periods due to their extensive root systems that reach depths of over 3 feet. Managing your ranch for both annual grasses and perennial grasses can benefit production in many ways. Annual grasses produce high amounts of digestible protein in a short amount of time. Perennial grasses tend to grow more slowly and stay green longer, and can thereby extend the high-value grazing period by a few months. Using proper management best utilizes these high-value forage periods while they occur, potentially reducing the need for supplemental inputs.